The Medieval Star of Destiny Dagger merges classic high Middle Ages style with mystical Masonic symbolism, yielding a display piece that's truly a stunner, both from afar and up close. Even from a distance, it's easy to appreciate this crimson and gold beauty's elegant medieval form. The 13 1/4" false edged stainless steel blade features a sleek spear point design with fluid lines that wed seamlessly with the golden hardware that comprises the handle, guard and pommel. It's here the Star of Destiny Dagger really shines up close. The guard is covered in swirling floral patterns in pleasantly tactile relief and a shimmering gold hue. This affords a perfect backdrop for the Freemason compass seal and numerous other Masonic embellishments, each cast in a smartly contrasting matte gray metal alloy. 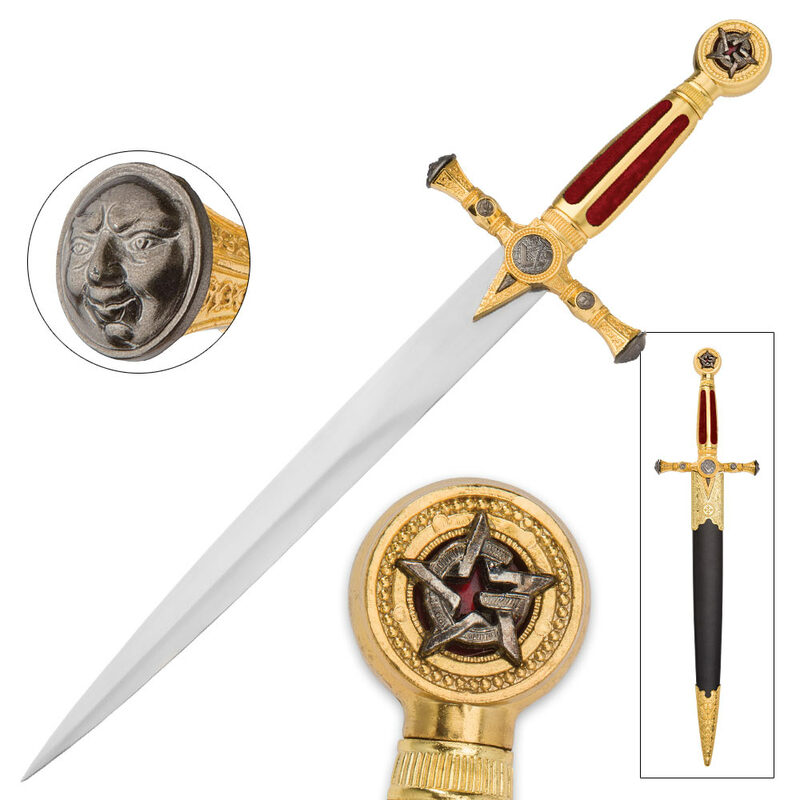 The elegant subdued-gray-on-gleaming-gold theme is continued across the expanse of the handle - also accented with a soft red velvet-like fabric - and onto the circular pommel, which showcases the cryptic Masonic "G" intertwined with a five-pointed star in extraordinary three dimensional relief. Tastefully simple bead-like dots ring the gray metal alloy "G star." Even the included polymer sheath is dressed in gorgeous Medieval finery. It's black with a golden end cap and collar, both cast with additional fine relief patterns. You really have to see this striking display piece up close to appreciate all its intricate details, but that's not to say it won't draw admiration and praise from those who view it from across the room - mounted on a wall, placed on a mantle or bookshelf, or set amongst other knives and swords in a fantasy blade collection. 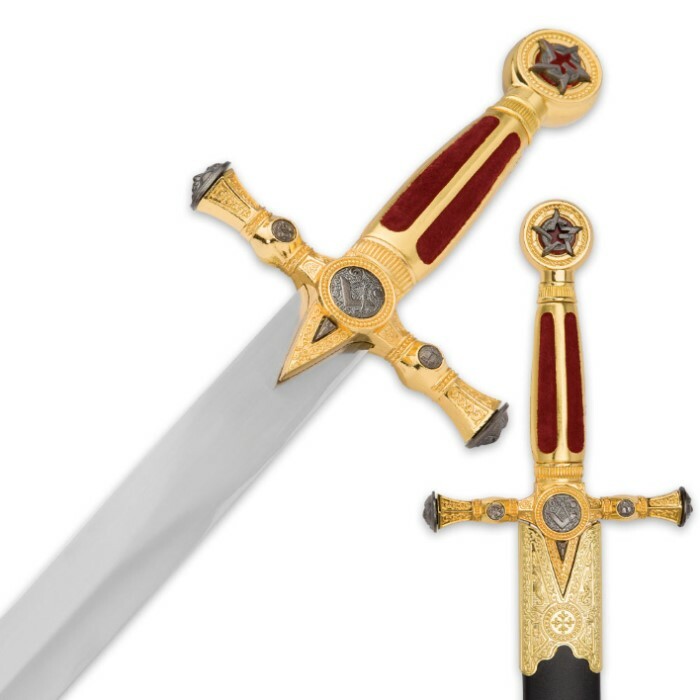 Indeed, the Medieval Star of Destiny Dagger is a dazzling work of art, near and far. 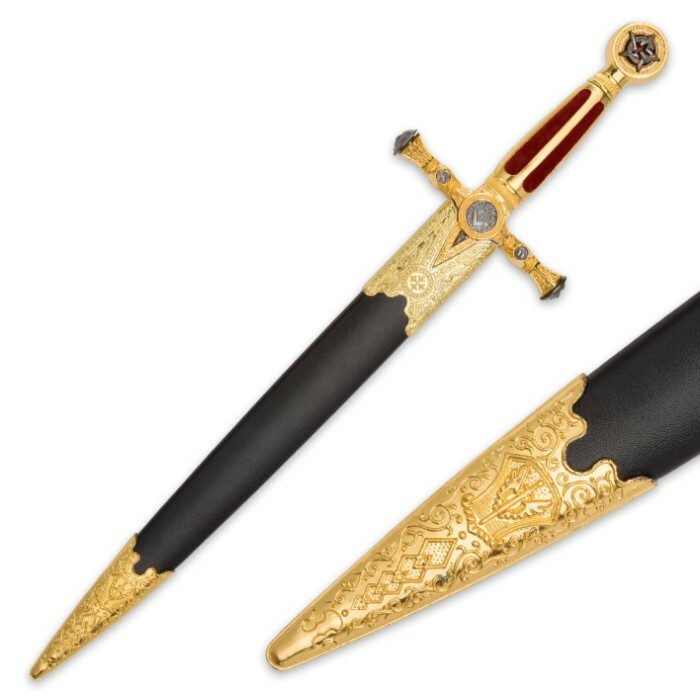 Makes a fantastic gift for Freemasons, Middle Ages historical buffs, antique weaponry collectors, knife/sword collectors or anyone who appreciates beautiful form and fine craftsmanship. Get this item if you want a good looking display dagger. The item description tells you it has a false edge,so that should say what this dagger is for,so if you're aware of that,you should be happy with this dagger.